Arnie, a young boy with sensory modulation difficulties, learns about the different tools and techniques he can use to help him keep his restless body calm so he can do his work at school and at home. These provide his nervous system with the additional movement, touch, oral, and heavy work input that he needs to be more successful. He also uses tools to limit sound because he is very sensitive to auditory distractions. Sensory tools & techniques include a big ball to sit on instead of a chair, a "fidget" for his hand, a plastic piece on his pen that he can chew, a weighted blanket & vest, a stretchy band on his chair, headphones/earplugs, running errands, jumping on a trampoline, etc. Sensory integration dysfunction- Fiction. Sensorimotor integration- Fiction. 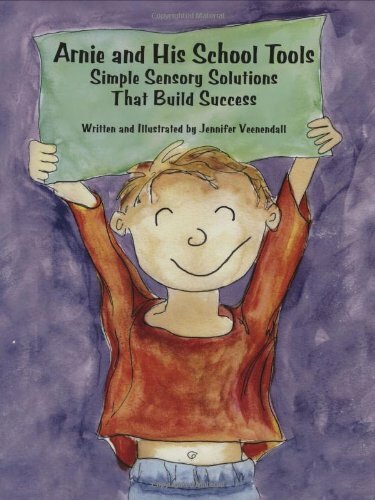 Includes an overview of sensory processing and also discussion questions. IL 1-5.